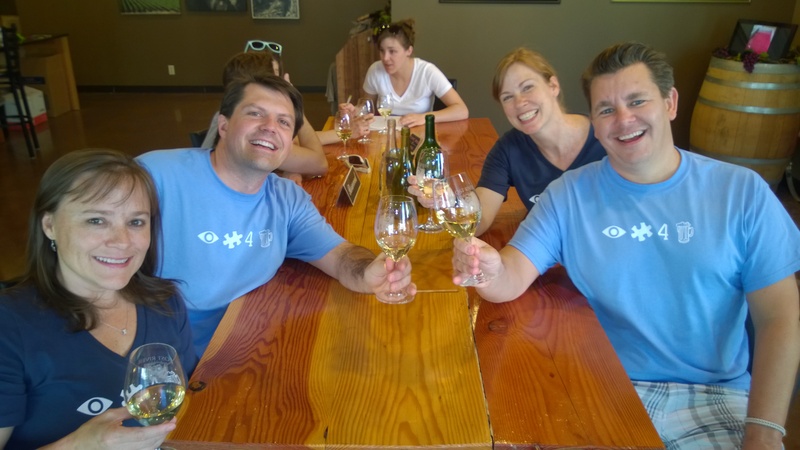 Recently we took our friends Crystal and Troy on a Savour Seattle Food Tour. 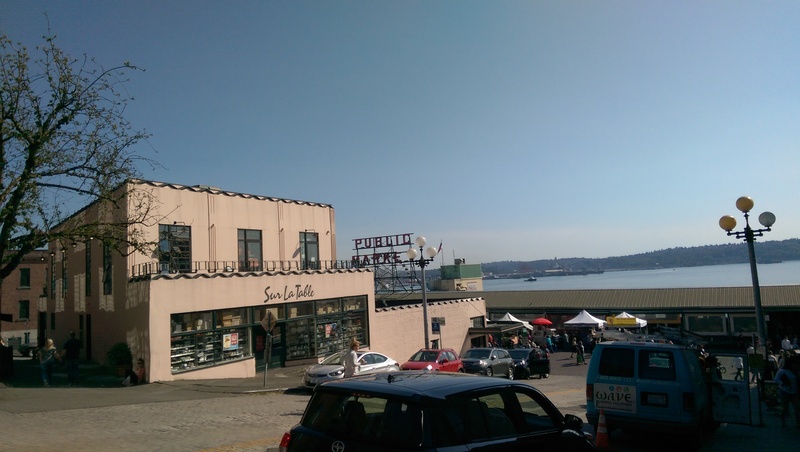 My sister, niece and nephew had been on Savour Seattle’s “Tour of Pike Place Market” and they so enjoyed it, they gave me a gift certificate for a tour. 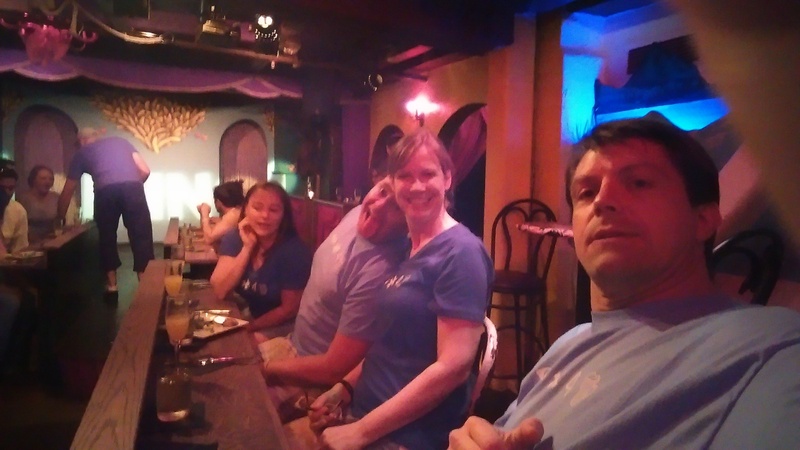 Chad, Crystal, Troy and I decided to enjoy the “Booze and Bites” tour for the best of everything! 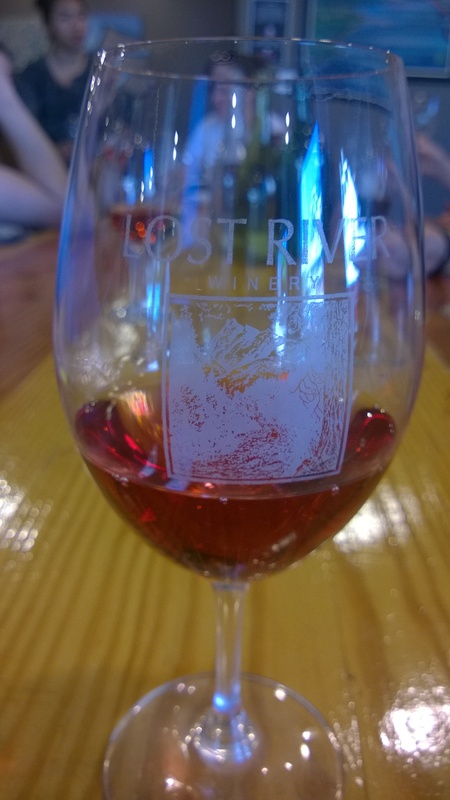 Our tour began at the Lost River Winery, currently located near Cutter’s restaurant near Pike Market. (But we understand the building has been sold, so Lost River will be changing locations in the near future). We started the tour with a crisp white semillion/sauvingnon blanc blend. With the warm weather, the crisp white wine was a refreshing start to our tour. Lost River followed the white wine with our choice of either their rose or their red blend. Chad and I opted for the red, which was quite tasty. After these quaffs, our tour guide Mark (who called himself “Mark Poppins” because he sported a bright pink umbrella – in true tour guide fashion), led us through the Market to Cantina de San Patricio in Post Alley. 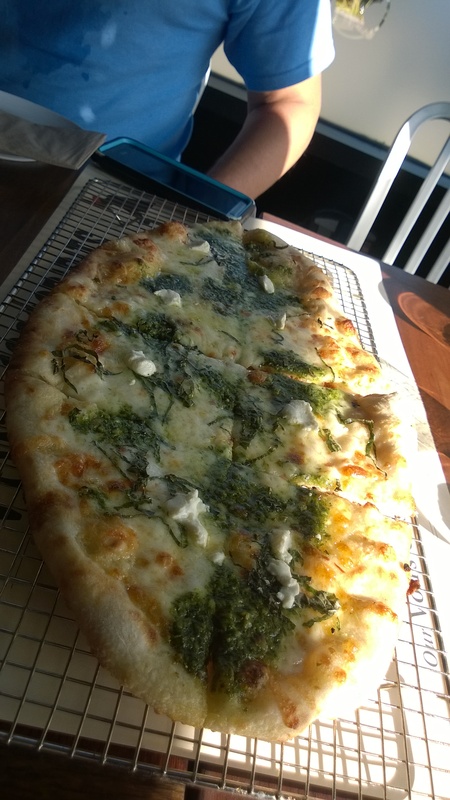 Patrick, the owner, named his restaurant after Saint Patrick’s Battalion, a unit of mostly Irish immigrants who fought for Mexico in the Mexican-American War. Patrick’s restaurant serves delicious Mexican food paired with lively cocktails. They set our group up at a long standing bar, where we feasted on carne asada tacos and sipped a delicious grapefruit cocktail. 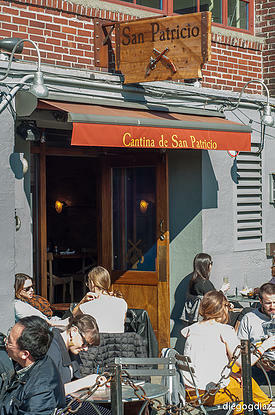 From Cantina de San Patricio, we walked uphill on Stewart Avenue to the corner of Stewart and 2nd Avenue, where we went back in time and entered Long Provincial Vietnamese Restaurant. I say we stepped back in time at Long Provincial Vietnamese Restaurant, because this restaurant has a very retro feel to it. But the food and drinks were timeless. 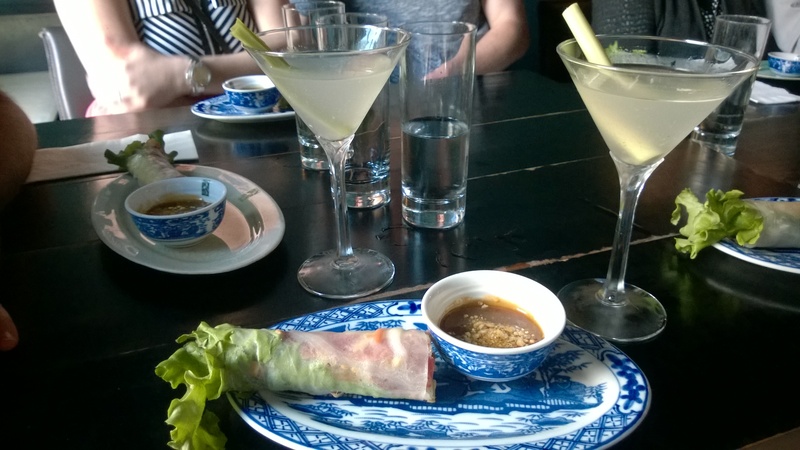 We enjoyed a fresh spring roll and a vodka/lemongrass martini. 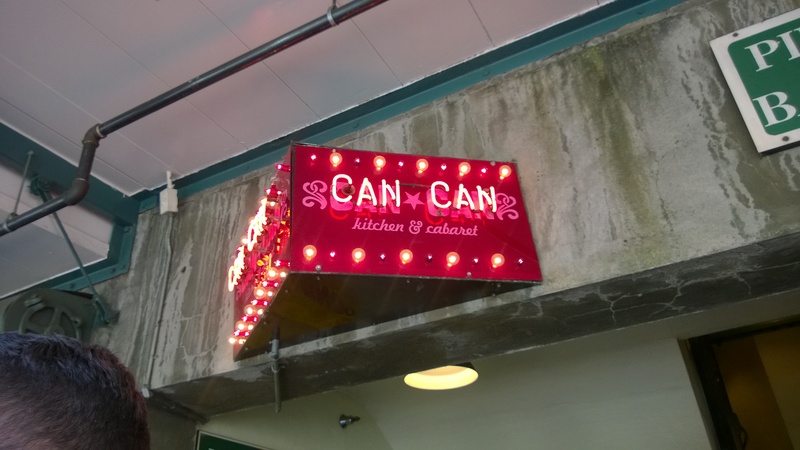 After Long, we headed back to Pike Market to the subterranean Can-Can Theater. 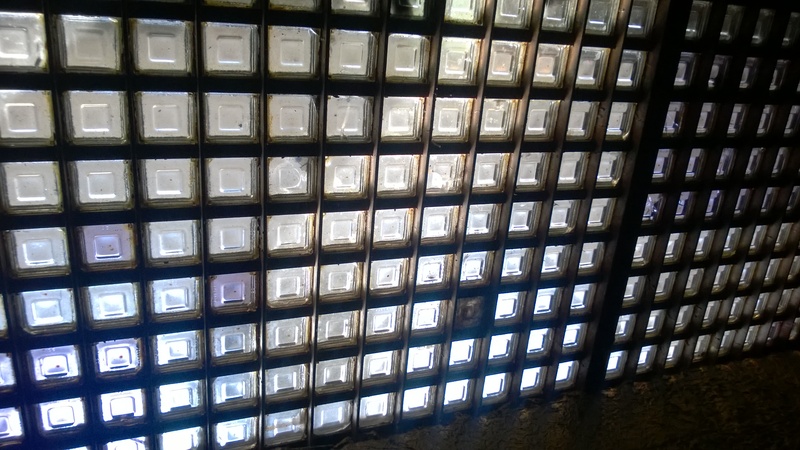 The first room we entered was the Absinthe & Craft Cocktail Bar, which is located directly below the sidewalk outside Pike Market – you can watch people walking above you on the glass tiled sidewalk/ceiling. 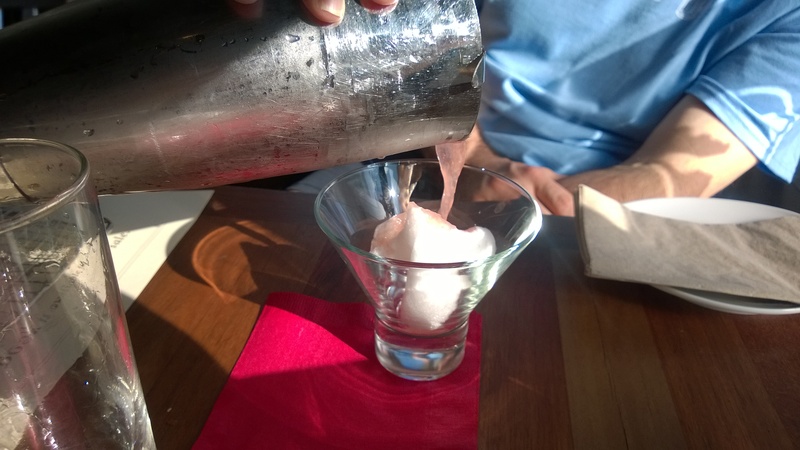 Our bartender regaled us with the history, facts and myths of the mysterious (and once illegal) drink Absinthe. We learned that this drink, often called the “Green Fairy,” was banned in America in 1912 and only reintroduced in this country in 2007. 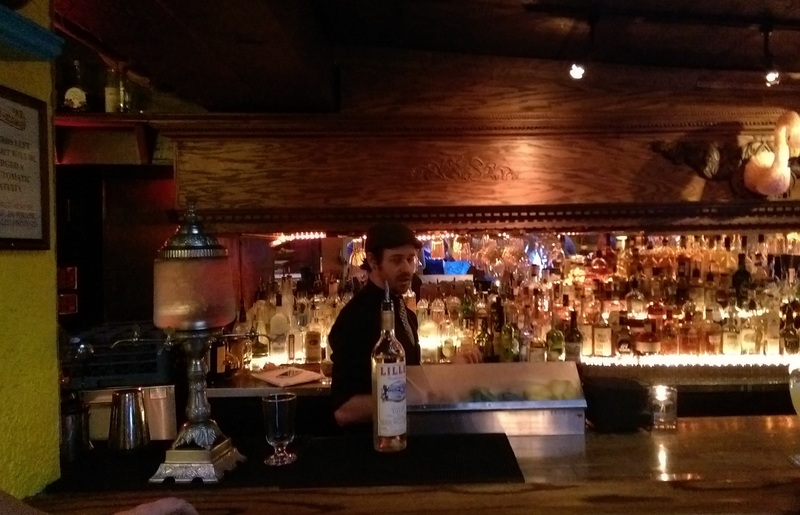 The Can-Can bartender providing a history of absinthe. While much maligned as a hallucinogen, our bartender pointed out that those who might have experienced hallucinations, such as Hemingway, were drinking Absinthe while also partaking of other strong substances. 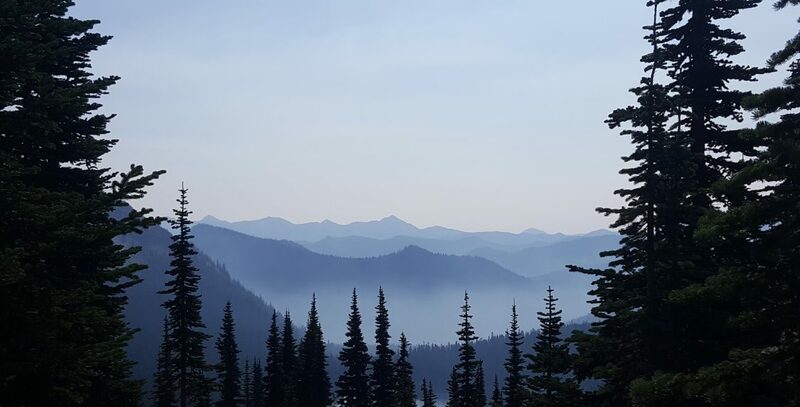 It is also rumored that the stir around Absinthe was largely brought about by wine makers in hopes to detract sales of Absinthe and lure its drinkers back to wine. We then filed into the theater and enjoyed “Pike-Place-Market-Fresh” creation of bacon-wrapped prawns and arugula salad, while sipping our “Part Time Lover” Absinthe vodka cocktail. 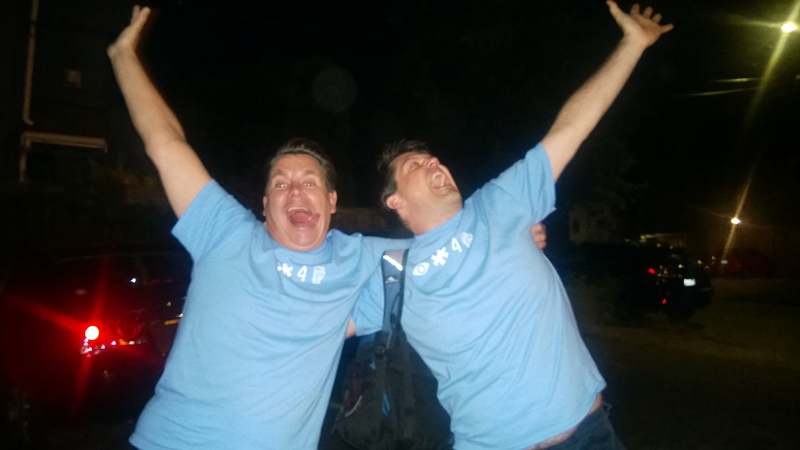 No hallucinations followed, although our selfie is a bit blurry! On to the next stop on the tour! and a roasted tomato pizza along with some red fruity cocktail – at this point in the tour who can remember?! (Just kidding – I was in the ladies room when they announced the cocktail, so I never learned what it was). It was at the end of this feast that Mark bid us adieu. 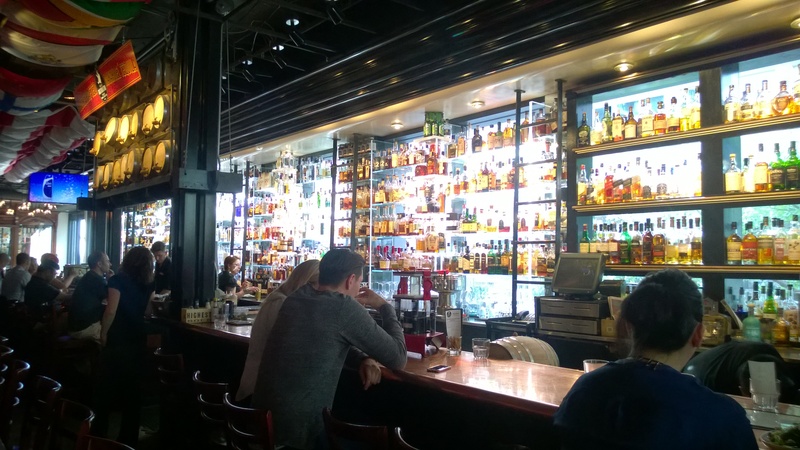 The Booze and Bites Tour was a fun way to try a lot of different places that Chad and I had not been to previously and now we will be sure to revisit with others. 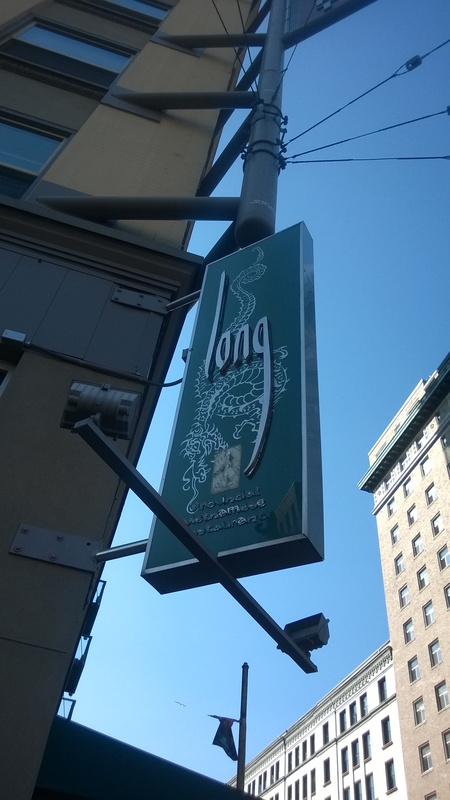 We also look forward to going on some other food tours through Savour Seattle. 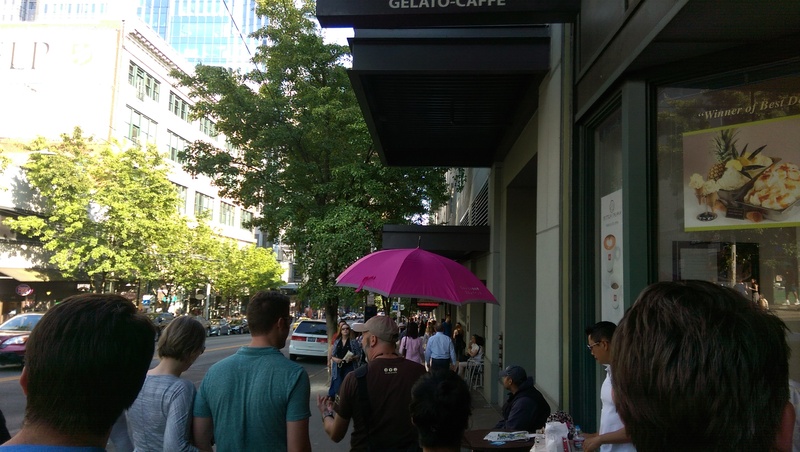 They offer a Chocolate Indulgence Tour, a Gourmet Seattle Tour, the Pike Market tour my family went on and enjoyed!, and many others. 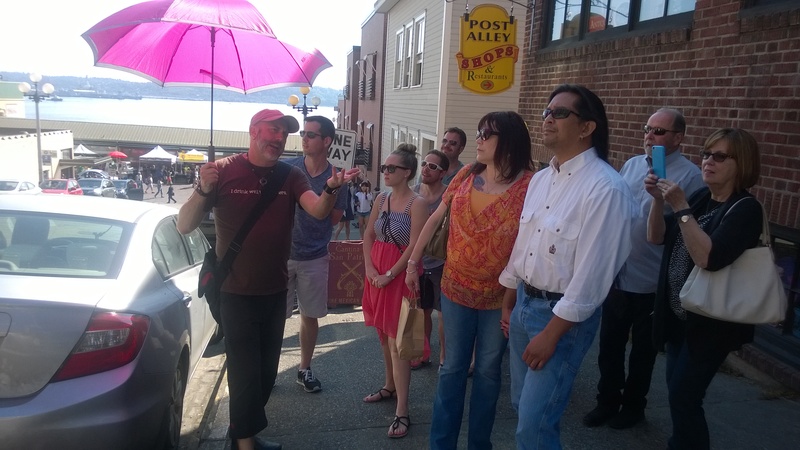 If you’ve been on a Savour Seattle Tour that you’ve enjoyed, please let us know which tour was your favorite.